Dr. White, DPM of FootCare Center of Orange in California discusses her preferred treatment method for wounds. As we end 2011, and having attended the fall SAWC in Vegas last October, I continue to confirm why Chronic Wound management continues to evolve. In my last couple of years in wound care; I have found two unique products that are revolutionizing the way we treat chronic wounds. Anacapa Technologies, Inc. has introduced two much needed products for wound irrigation as well as a primary dressing for lazy to angry wounds; Anasept® Antimicrobial Skin and Wound Cleanser and Wound Gel, to be used for wounds with MRSA and all the others with polymicrobial bioburden; either critically colonized or infected that stall the healing process due to bacteria load. As a CWS nurse, I have the opportunity to get close to the wounds and follow them until they jump start by reducing the bacteria bioburden and removing the necrotic tissue. Anasept® Antimicrobial Skin and Wound Cleanser has provided exciting results by removing biofilms and lowering the bacterial load to a contaminated level. So I routinely irrigate wounds with Anasept® Antimicrobial Skin and Wound Cleanser and follow with Anasept® Antimicrobial Skin and Wound Gel in the wound bed and leave alone for several days with this treatment, I recommend to the physician to try the Silver-Sept® Antimicrobial Skin and Wound Gel gel to the wound bed and change the dressing every 2 to 3 days. I love it. Wounds heal and we are able to be cost effective. I develop protocols for nursing homes and home health and always add these three products to the formulary plus a film and foam. Administrators, DONs and the treatment nurse are satisfied on saving money and getting wounds to heal or keep them from worsening. This is standard of care and evidence based best practices. I have been using Anasept® Antimicrobial Skin & Wound Gel in my practice (Wound Care and Hyperbarics) for 2 years now. Before Anasept and concomitantly with it I was using many other products (Microcyn®, SilvaSorb™ and several hydrogels), which provided me with an opportunity to compare their efficacy, ease of use, antibacterial and debriding properties. With ever increasing cost of medical treatment the price of the product also deserves serious consideration. I found Anasept® Antimicrobial Skin & Wound Gel to be inexpensive and easy to use, just like any hydrogel. Since my patients are mostly diabetics, prone to multiple and serious infections, antibacterial properties of the gel are of significant importance. 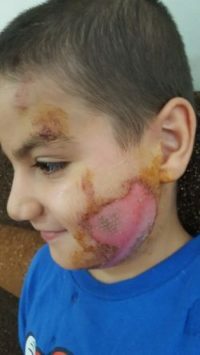 In my observation, Anasept® Antimicrobial Skin & Wound Gel prevented essentially 100% infections in the wound and helped to eradicate many of the already existing ones. This gel works very well against microbes while providing moist environment for an undisturbed healing of the wound. Overall it is an inexpensive product that provides clinician with the ease of use, antibacterial and anti-odor properties, and creation of good healing environment. Silvasorb is a trademark of AcryMed, Inc. and distributed by Medline Ind., Inc., Mundelein, Il. Anasept® Antimicrobial Skin & Wound Gel has proven to be a safe, powerful and cost-effective antimicrobial gel that is much needed in the field of advanced wound management. Across the continuum of care, including hospital inpatients, outpatients and long-term care residents, we have incorporated Anasept into our treatment algorithms as it is a powerful non-cytotoxic, odor-reducing alternative to expensive prescriptions and compounded agents needed to fight tough wound infections. Please accept my sincere appreciation thank you for allowing me to use your Anasept Gel and Wound Cleanser. 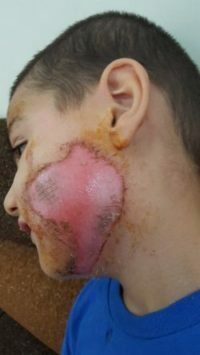 One of my relatives suffered a high-degree and serious burns because he was handling Acid. 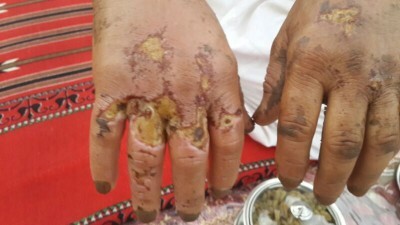 The doctors decided to do an operation to remove the dead skin and to repair the burn marks, and if the operation did not succeed they will amputate the fingers. I took him out of the hospital and gave him Anasept Gel—manufactured by your company—to use for only one week. 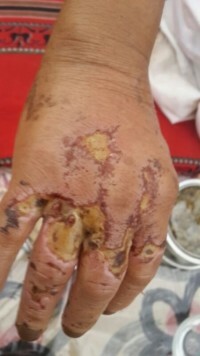 The results were stunning, it healed the wound completely, the skin started to grow back and the deep holes caused by the Acid were sealed—as you seen in the attachment—knowing that the injured is diabetic. Thank you for this product. Note that, it is not available in Saudi Arabia, and the Ministry of Health is using (MEBO) and other gel products that gives a slow effect and sometimes does not work. I am hoping that your products will be available to us here in anytime soon. We have received the product (Anasept Wound Cleanser & Gel) and it is WONDERFUL!!! My wound care nurse can not praise it highly enough. We will be in touch for reorders. Thank you for your prompt reply to my request. I am grateful for the opportunity to try your product. As a Wound Care Certified Nurse, I am always attempting to keep current with the newest and least costly products for our Sister Community. With the current cuts in CMS reimbursement, it is a necessity to acquire the products dictated by the current pharmaceutical insurer. Assisi House is an independently funded home for the retired Sister of St. Francis and does not utilize Federal funding: therefore we attempt to find products that are efficient and cost effective. At present, our facility is proud to boast a low percentage of pressure ulcers and those are stage I and stage II. We are fortunate to have the highest quality of personnel with a sense of caring, discipline and attentive skin integrity. The ease of application and effectiveness has been proved in our trial use of Silver-Sept on a tunneling wound that has previously been surgically debrided. The wound was on the trochanter area and was too small to pack with any product other than a gel. The Silver-Sept was used for a two week trial with reduction in the depth and closure of the wound to .05 centimeter diameter. We currently are using a protective dressing only. We are discussing the use of Silver-Sept on a vascular wound that has been difficult to heal. I will keep you informed of our progress. Thank you again for supplying us with a sample of your product. We are certainly positive about future use of Silver-Sept in our facility when the need arises. My ostomy surgery was in 1985 and I have been looking for a odor eliminator with not much success “until” I found you, what a great product you have!!! Thanks for solving over 16 years of frustration. Sacral stage 4 pressure injury: 5.6 x 5 x 1.5cm. Foul odor. 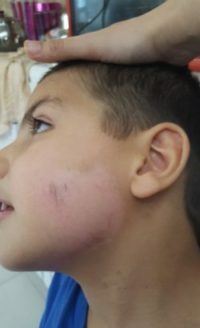 Hi..have a nice day,as I promise you regarding the pat.management by anasept.product, hear this story please; this is a child (my sister’s kid) of 10 year old age male,with trauma to the face and Rt.elbow he is otherwise normal kid while he ride a bicycle near his home suddenly stucked by a car, and fall down, causing Lt.facial epidermal laceration and looks like 1st degree burn,semi circular around 6*8 cm. and elbow abrasion ..upon using 2 technologies (anasept solution and twice times xeroform petrolatum bismuth dressing and 3 days apart in between the dressings their was a dramatic improvement.here the attached files shows pictures before and after anasept application. The last picture shows good improvement..
Anasept working it’s magic again! My staff is noticing a significant improvement regarding wound healing. 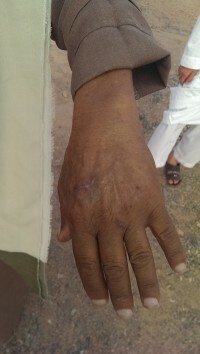 Chronic wounds that have appeared stalled and now showing progress. We are definitely seeing good results with Anasept. When compared with other products on the market claiming to have debridement properties, Anasept is a superior product. Patients using Anasept in our outpatient wound clinic had a decrease of at least 25% in nonviable tissue within seven days. Two patients using Anasept had 100% decrease in nonviable tissue within seven days and one patient in four days. I would highly recommend this product as an alternative to enzymatic debridement products as it appears to facilitate healing and promote more positive outcomes for patients. The fact that this product also destroys the biofilm and bioburden all while neutralizing odor is another bonus. Last, but not least the Anasept Gel is significantly less expensive and reimbursable! I wanted to let you know that recently I tried the Anasept Spray & Anasept Gel on one of my residents at a LTC facility, based on your high recommendations. We had such great results that the Wound Dr. who I work with has been ordering this combo at different facilities he works at. Her right medial foot wound was determined to be palliative care d/t thick adherent necrotic tissue that returned quickly after sharps debridement. We started using the Anasept products (about 1 month ago) and the wound bed is filling in with granulation tissue and the necrotic tissue is slowly dissolving! We may actually get this wound to close! Just wanted you to know. Thanks! !